Whether you like it or not, customers are publishing feedback on your products and services on the internet and via social networking sites like Twitter and Facebook. What your customers say is incredibly valuable. Positive feedback boosts business and criticism can help you to improve your offering, says Chris Barling of Actinic. In the past year or two the spectacular rise of Facebook and Twitter have led to enormous business interest in social networking. Despite the talk, I believe there have been limited examples of profitable activities. Arguably, the customer feedback arising from social networking is the exception, and it is this that is currently helpful to businesses. It’s a fact that every significant business now gets feedback spread across the web, and it doesn’t matter whether they want it or not. This is a big change. Before the internet, dissatisfied customers had limited options. Sure, they could ring the company and maybe tell their friends. There was Trading Standards or even legal action, but none were serious threats. Today, it’s different. As a result, it’s hard to find any reason why a serious online retailer would want to avoid having user-generated reviews of products and services on their site. It ensures that there’s plenty of good feedback to balance out any bad. It provides management with information and brings problems quickly to the fore, enabling them to be fixed before they get out of hand. Implemented in the right way, feedback can add significant depth and a feeling of integrity to product pages. It can’t easily be copied by competitors and the variety of text is attractive to search engines — the most relevant and latest keywords will automatically be used by customers. Google now has specific feedback tags, putting the information straight into its results page. With the assumption that good quality service is your aim, great comments from previous buyers makes it easier for prospects to turn into customers. Research shows it’s likely that you can exceed a ten per cent rise in sales from a good feedback system, as well as reaping the benefits from improved search engine positions. 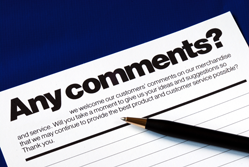 There are two choices for dealing with customer comments: they can be managed by you or by an independent third party. The second option seems crazy — why would you want to give up the option to edit or delete venomous comments? But if you tamper with feedback, you risk an even stronger negative reaction. And no one likes censorship. Keeping negative comments on your site makes them less likely to appear elsewhere and ensures that you can reply showing what action you took. Personally, when I look at feedback I search for some negative comments. In my mind this validates the positive. Every business gets things wrong occasionally and everyone has awkward customers. Feedback that sounds like marketing copy is feedback to be ignored. The negative endorses the validity of the positive, and the way you deal with problems enhances your image. There are good reasons for restricting feedback to actual customers. They are actively engaged, you can directly solicit feedback from them and make it easy to respond. In practice, much more feedback will be delivered by targeting your own customers. That approach also excludes competitors and prevents disgruntled customers feeding back repeatedly. This is a real problem with unrestricted feedback systems. Social networking is becoming the norm. Buyers expect a much more interactive experience, and they are less and less impressed with marketing copy. It’s an accepted truth that listening to customers is critical, but previously it was still possible to run a company while ignoring this virtue. The choice is now between helping customers to provide feedback that can grow your sales, or ignoring the issue and not being sure what happens. This is an important and growing area that every web store needs to consider. Chris Barling is CEO of Donut sponsor and e-commerce software firm, Actinic.